Neighbors chat with each other on Monument Avenue in Boston during Winter Storm Neptune. During the last week of January, Winter Storm Juno brought heavy snow, high winds, and coastal flooding on locations from Long Island, New York, to many parts of New England. New York City received more than 9 inches of snow. In Lunenburg, Massachusetts, there was 36 inches of snow from Juno! In eastern Massachusetts, there were wind gusts from 50 to 80 miles per hour. This led to coastal flooding in areas such as Scituate (sih•chuh•wuht), Massachusetts. Thundersnow was reported in coastal Rhode Island and in parts of Massachusetts. Thundersnow is an unusual kind of thunderstorm in which snow falls instead of rain. While people in the Northeast were still recovering from Juno, another winter storm hit the region. On February 2, Winter Storm Linus brought 16 inches of snow to Boston, Massachusetts. This severe storm also caused a flash freeze that led to delays on Boston’s and New York City’s public transportation systems. Linus even caused the victory parade for the Super Bowl Champion New England Patriots to be postponed. Another storm hit Boston and other places in the Northeast the week of February 9. Boston got more than 23 inches of snow from Winter Storm Marcus. This storm severely affected Boston’s public transportation system of trolleys, commuter trains, and subway lines. Massachusetts Governor Charlie Baker declared a state of emergency. Over President’s Day weekend, yet another snowstorm hit the Boston area. Winter Storm Neptune dumped 16.5 inches of snow on the city. 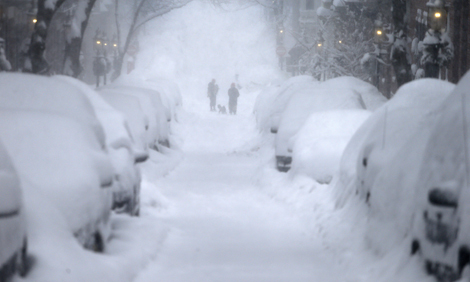 So far this winter, Boston has received more than 95 inches of snow. It is only 12 inches away from having its snowiest winter on record. In some parts of New England, Neptune brought temperatures in the 20s and 30s below zero. These powerful winter storms have caused many school closings. Travel on highways has been dangerous and public transportation continues to be affected. With all of the unusually harsh winter weather hitting the Northeast, it was fitting that Pennsylvania’s legendary groundhog Punxsuntawney (puhnk•suh•taw•nee) Phil predicted six more weeks of winter. The legend says that on Groundhog Day, February 2, if Phil sees his shadow, there will be six more weeks of winter. If he doesn’t see his shadow, spring will come sooner. Many Northeasterners are hoping the groundhog got it wrong. Which winter storm arrived on Groundhog Day? Which of the following big cities was affected by the winter storms?